I have been saying I need to read Julia Quinn for some time now. If you say this would be a good introduction I will have to add it. Great review!!! I haven't read anything by this author mainly because I rarely read historical fiction, but I've heard quite a bit of good things about this author. I have to try her books some time. !!!!!!!!!!!!!!! Yay! You know how much I adore this one. I do agree, Elizabeth totally overreacts when she discovers James' secret, and I always get so frustrated with her then, but besides that this book is just about perfect! I love the part after Elizabeth finds out his secret, and Elizabeth, James, Caroline and Blake are all in this room trying to talk this out and James yells "The only thing important about this book is that you marry your damn marquis." I always get a little swoony then. Lady Danbury is fantastic, too! And I loved her cat! Perfect timing! I just finished a reread of The Viscount Who Loved Me, and was thinking I need more Lady Danbury. Time for me to reread How To Marry a Marquis! And what a lovely review... "crisp and witty" is a perfect description of Julia Quinn at her best. I'm so glad the book held up for you on the second reading. I remember laughing out loud the first time I read it, which (like you) has to be 12 or 15 years ago. 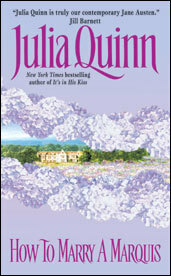 I just started reading Julia Quinn--the Bridgerton series. I've read the first two and am LOVING them. I'll look up her other books and find the order of her other books, but--where do I first find Lady Danbury? I am also a little terrified to go back and reread favourite books from years ago. Especially since my taste and reading repertoire has changed quite a bit. Glad you still really loved this one. Standing the test of time is a win. I've seen this author around, a lot, but haven't picked up anything. Maybe I'll put this one as the place to start. When I do. I enjoy Julia Quinn and haven't read this one. Of course I loved the Bridgerton series, unfortunately I let those books travel on, should have kept them! I need to read one of her books - only two so far. This title is going on my GR list. I seriously want to toss my NG list out the window and just go read Julia Quinn and Nora Roberts. 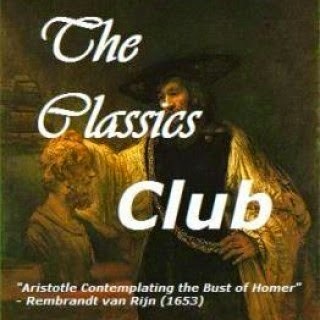 I love Julia Quinn and I believe I found her thanks to you. I don't have book four in the Bridgerton series. I'd love to find it used but I think I'll have to break down and buy a new copy. I feel though I have to reread the first three to refresh my memory.